Yesterday night I started making cake pops for my husband because that’s what he wanted. Well the cake baking went well. The ball forming went great. I froze them for 30 minutes like the recipe said. Then I dipped the lollipop stick into the chocolate and pushed it in about 1.5 inches. After I had done this to them all it was time to dip! This is when it all went to hell. So I did. My gracious roommates went to go get butter for me, and some frosting for the still frozen cake balls. And considering it’s 130. I am dealing with that..tomorrow. So I started making frosting. The first one came out great! 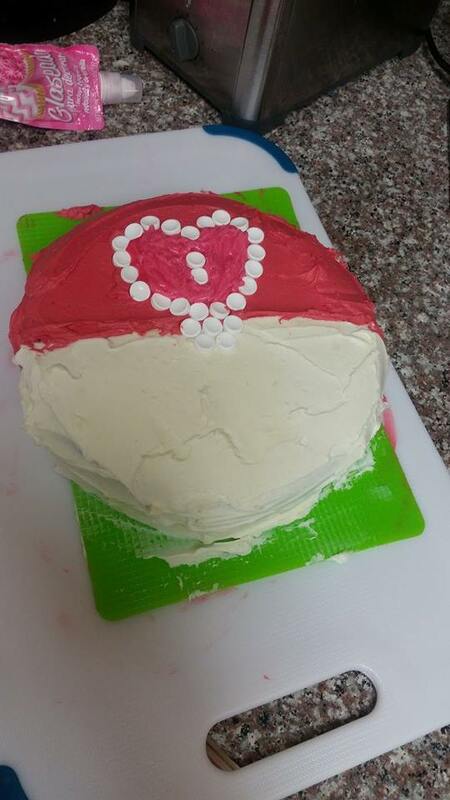 When I started working on the second frosting, a red one because I am making a pokeball cake, I accidently spilled the red melted chocolate on the front of my shirt. It looked like I got hit with a paintball. Frosting still comes out yummy. But not red. So I use my bottle of red food coloring. It’s just a darker pink but still not red. So I asked Joe if there was any pink pokeballs. He says the love ball. We have everything so that’s what I do! This is my finished cake project. I did 2 9 inch rounds and the frosting inside is green like there is a green pokemon inside. I showed it to Joe and he loved it and didn’t want me to do the black outline in the middle. So I didn’t. I hope it all tastes good! This entry was posted in Life Things and tagged bake, bakes, baking, cake, cake balls, cake pops, chocolate, frosting, love ball, poke ball, pokeball, pokemon. Bookmark the permalink.